Download a pair of passes to see KONG: SKULL ISLAND in San Diego! You can download an admit two pass to see the new movie KONG: SKULL ISLAND at Edwards Mira Mesa Stadium 18 IMAX & RPX - 10733 Westview Parkway, San Diego, CA 92126, on Monday March 6th, 2017 at 7:00pm. 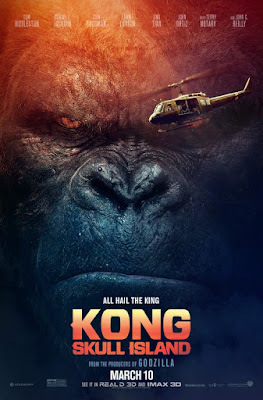 Warner Bros. Pictures and Legendary Pictures’ Kong: Skull Island reimagines the origin of the mythic Kong in a compelling, original adventure from director Jordan Vogt-Roberts (The Kings of Summer). In the film, a diverse team of explorers is brought together to venture deep into an uncharted island in the Pacific—as beautiful as it is treacherous—unaware that they’re crossing into the domain of the mythic Kong. KONG: SKULL ISLAND opens in US Theaters on March 10th, 2017. Disclaimer: NO PURCHASE NECESSARY. Passes available on a first-claim first-serve basis. You will need to register for a free WBTickets account in order to redeem the passes and each registered user account is limited to claim one admit-two pass. SEATING IS LIMITED, SO ARRIVE EARLY. PASS DOES NOT GUARANTEE A SEAT AT THE SCREENING. Refer to screening pass for further restrictions. CLICK HERE to join our Mind on Movies San Diego Email List.